Sometimes, you have to marvel at the ingenuity of Lego fans. There's only so few people who think 'Oh I know, I'll make myself a mask! Out of Lego! And make it light up and everything!' - and the end result is this wonderful replica of Star-Lord's mask. 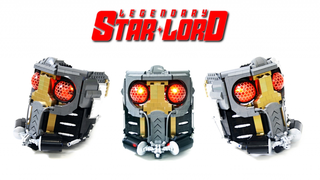 Made by Alexander Jones - a.k.a Orion Pax - the mask recreates the design seen in both the Guardians of the Galaxy movie and worn by Peter Quill in his standalone Comic series, Legendary Star-Lord pretty faithfully and even has light-up Lego bricks placed in the eye pieces, so they can shine through. Jones describes the mask as being 'nearly 1:1', which means if your head is juuust the right size, you could totally wear this amazing Lego creation. I wouldn't try any other part of Star-Lord's getup made out of Lego though - I mean, I guess his Element Guns would work, but I'm betting a duster made out of Lego bricks would be both heavy and uncomfortable. And incredibly impractical if you wanted to move your arms! Check out a few more pictures at the link below.